Born on 1964 in Niigata Prefecture, Kenji Uchiyama’s humble beginnings started when he first worked in Hyogo and Nagoya. From 1995, he worked in the marketing division at the headquarters of Kirin Brewery for eight years, and later on became the regional director of the Miyazaki branch starting 2004. After that, Uchiyama became the planning manager at the headquarters, and in 2017, he became an executive officer. 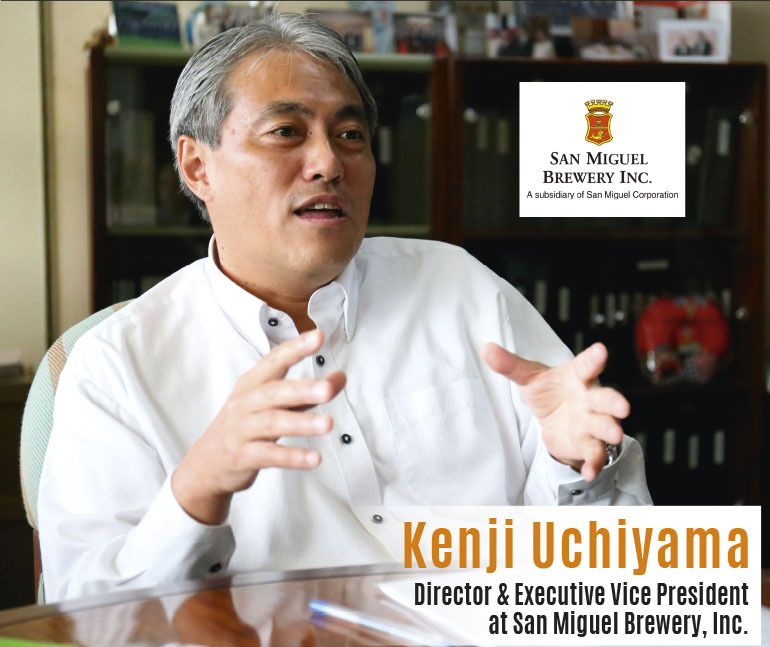 Finally in 2018, Uchiyama became the vice president of the Philippines’ leading beer company, San Miguel Brewery, which is jointly owned by Kirin Holdings Co. Ltd. He has worked in the headquarters and factories, wherein he gained a balanced understanding of both. He analyzes the expansion of the beer market in the Philippines and foresees diversified alcohol trends. Reforming their flagship product, Ichiban Shibori, will be the means of predicting their future. Talk about your experience in the university. I studied various elements of social science at Keio University. I took interest in and studied “brand management,” which naturally led me to the beer industry because I felt that beer reflects the world trends. My father owns a small business, so I could take that over, but I passed the job interview in Kirin, so I decided to join them. What did you do when you joined Kirin? In the first two years, I was based in the factory, located in Amagasaki City in Hyogo Prefecture. I was in the labor division, in charge of personal management and labor relations. After that, I was transferred to Nagoya and did sales for six and a half years. It is said to be the hardest job for newcomers, but if people like you, they will treat you as a friend—in fact, my part-time job experience when I was in college became useful. I was selling study materials door to door, and my sales result reached the top 2 nationwide! In this part-time job, I was thinking about how to strategically cultivate the market and build connections, holding a map and a memo in my hand. After Nagoya, where did you go? In 1995, I was transferred to the marketing division in the headquarters and stayed there for eight years. I was involved with marketing strategy for the whole company. After that, I was transferred to a factory in Miyazaki Prefecture—it had been a long time since I was in a factory. In fact, Miyazaki was predestined—Asahi beer grabbed the largest market share, but two years after I went to Miyazaki, we turned the table again. We focused on creating a reputation that we were the beer producer that revitalizes local communities. At that time, Asahi beer was popular. I had an eye on producers, such as farmers. 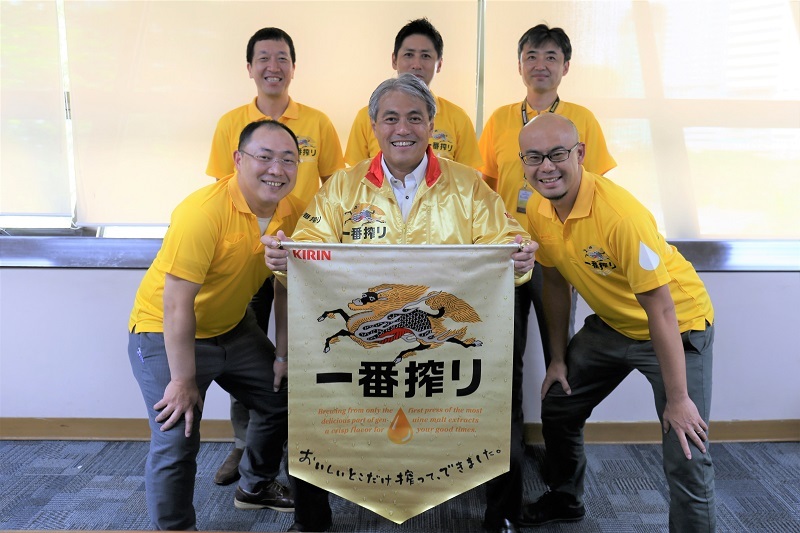 Kirin produced a local program, “Local production for local consumption.” In this program, local producers were introduced, and the program was broadcasted every week in Miyazaki. At the end of the program, we filmed people drinking Kirin beer around dinner tables. Then, in 2018, you came to Manila? Yes, in April. We are investing in San Miguel’s subsidiary, San Miguel Beer. 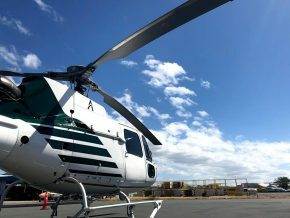 In Japan, the market is maturing and the decreasing birth-rate and the aging population is progressing, so we were seeking business opportunities overseas. 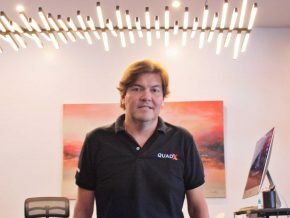 During the first time I came to Manila, I thought the Philippines was more vibrant than I expected but at the same time, I felt a big gap in economy. What can you say about investing in the Philippines? A good investment! At present, in the Philippines, beer accounts for 80% based on the alcohol volume, and 70% based on sales. If the economy grows, most certainly alcohol will do well, leading to diversified preferences. So, I feel that there will be more business opportunities in the Philippines! Beer, in particular, is popular in the Philippines, isn’t it? Yes. However, it has more potential when you look at the per person consumption. 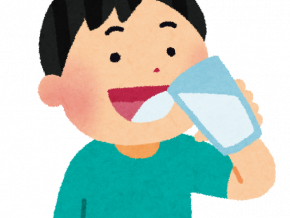 In Japan, a person drinks 44 liters of beer a year, but, in the Philippines, 17 liters only. If the economy grows, and income increases, the beer consumption will increase too. We must do something, as the Philippines’ economy is growing rapidly. This autumn, we are renewing Ichiban Shibori in the Philippines, and in the future, we will consider introducing draft beer too, so we would like to actively promote our products. Talk about your thoughts about future perspectives. The Philippines is now very vibrant, and I don’t think I can experience the same in Japan. I think, “What is the meaning of me being here now?” I would be happy if I can be part of this country’s development. John F. Kennedy’s Profiles in Courage. The book is about bravery and integrity in the careers of eight US senators in the 1900s and the book won a Pulitzer Prize. When a revolution is really needed, speeches that sound good alone are no good. This book makes me think about how much I can stick to my beliefs.